Polypropylene plastic is a recyclable ingredient found in many useful products. It is often marked with the number 5 by the traditional plastic coding system. It is considered a safe packaging solution as it does not drain any harmful chemicals into foods or liquids. Polypropylene (also referred to as PP or polypro) has the highest hot melt point of any of the plastics used to manufacture packaging. Hot fill is a sterilization process that is often used for liquid food products or non-carbonated beverages like some soft drinks, water, tea and vegetable and fruit juices. The high heat resistance is also an attractive alternative because the material will not melt in dishwashers. 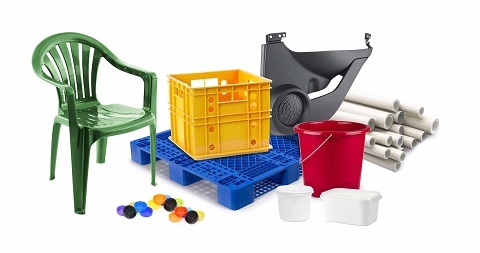 Containers, lids, caps, closures roping, hinges, auto parts, textiles, lab equipment and many other familiar products are created with polypropylene plastic as a main ingredient. It is not as brittle as other plastic resins and, combined with its high melt point, is a very popular manufacturing solution. Polypropylene plastic product creation can be attained either through the molding or extrusion methods. Useful items such as diapers, filters and face masks are products developed via extrusion. Cups, cutlery, caps, containers, batteries and housewares are the most common items made from injection molding. Still, Polypropylene plastic has seen a significant improvement in recycling in recent years and recycled PP products like shipping pallets, shovels, water cans, oil funnels, storage bins, ice scrapes and battery cases, mixing bowls, and cutting boards can be found on many store shelves throughout the world. The rate of polypro recycling is expected to increase by leaps in bound in the near future and the environment, as well as consumers, will be the beneficiaries.